Staying ahead of the competition represents an ever more difficult challenge in today’s prepaid communications market. In addition to lowering their prices, providers have to offer more complex and attractive services to the increasingly knowledgeable and demanding customers. Enabling triple play services with a real-time architecture presents new challenges for mobile prepaid solutions. Working and maintaining simultaneous sessions, providing advanced call control features and providing customized IVR capabilities are all part of the prepaid platform. MINDBill is a flexible, real-time customer care and billing solution implemented by tens of prepaid operators worldwide. It scales to support millions of users and an unlimited amount of concurrent sessions, while delivering critical real-time functionalities, sustaining different and complex prepaid scenarios and providing a broad portfolio encompassing data, multimedia and voice services. The real-time architecture of MINDBill allows providers to offer multiple prepaid services, including rechargeable cards, disposable cards and prepaid accounts, while providing accurate service management and achieving maximum business efficiency at the same time. The MINDBill prepaid server enables real-time AAA (Authentication, Authorization and Accounting) by identifying the subscriber at service initiation, authorizing the specific service, returning the cut-off parameters (duration, volume, go/no go), constantly updating the customer’s balance and cutting-off the session when the balance bottoms out. As a prepaid pioneer, the MINDBill Mobile Prepaid Platform is a scalable and redundant platform already interoperable with the Voice, Data and Video market leaders. 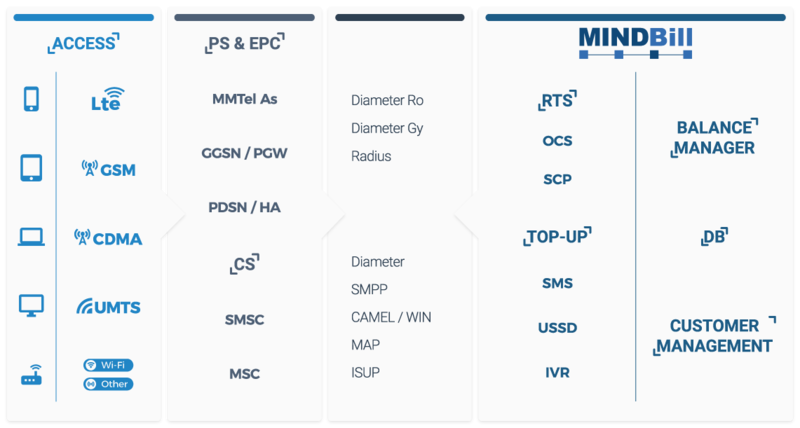 The comprehensive prepaid solution is aimed for a multi-play service environment, and it supports quota allocation for the circuit switched voice network using either ITU/ESTI CAMEL for the GSM infrastructure or ANSI/WIN for the CDMA infrastructure. Furthermore, it provides 3GPP CAMEL support for the packet data network via the IN SCP or, alternatively, it elaborates a direct DIAMETER (3GPP and IETF complaint) or RADIUS (3GPP2 and IETF) interface for quota allocation and final session charging. Full prepaid roaming capabilities are supported for both IN supported partner networks and non-IN supported partner networks. Providing both Interactive Voice Response (IVR) services and Web-based tools to analyze and respond to customer behavior in real-time. Enables managing multiple services simultaneously from a single prepaid balance. Managing multiple electronic wallets per subscriber with intelligent replenishment options. Powerful rating engine that enables sophisticated rating and discounting models even for prepaid services. Automatic creation of one-time and rechargeable vouchers and calling cards by lots, each enabling different services, charging models and access restrictions. Communicate with your subscribers via SMS, USSD or e-mail. Notifications are configured based on various business rules events such as: reaching a threshold balance, payment confirmation and much more. Maximizing the utilization of resources and converting raw data into business intelligence. Revenue leakage and fraud are prevented, as the entire network is constantly monitored.